Roy Halladay was one of the most dominant hurlers of the previous decade, and now his name and a plaque will symbolize his career accomplishments deservedly in the National Baseball Hall of Fame. He'll be enshrined posthumously this coming summer in Cooperstown having received 85-percent of the vote from the Baseball Writers' Association of America, it was announced Tuesday. Seventy-five percent is needed to earn induction. Halladay spent four seasons in Philadelphia before retiring in December 2013. The highlights of his 16-year career include a pair of Cy Young awards, including one in 2010 in his first season with the Phillies, eight All-Star selections, along with a perfect game and a postseason no-hitter. "It would be an honor, but it's not something I think about," Halladay said shortly after announcing his retirement. "I gave it my all and did what I could while on the field. The accolades are great, but that's not what you play for." Halladay never had electric stuff, instead relying on smarts and pinpoint location to get batters out. He pieced together two fantastic seasons in Philadelphia in 2010 and 2011 before his arm essentially gave out. In an era where pitchers routinely failed to pitch beyond the seventh inning, he threw 67 complete games and led the majors in innings pitched on four different occasions. Aside from his command, Halladay was known for his grueling workout sessions and his desire to be in the best share possible. "One of the great pleasures of my career was being able to play behind a man like Roy Halladay," said former teammate Chase Utley. "He was fierce. He was competitive. He was focused. But, most of all, he was great. Not just a great player but also a great teammate and a great friend. On the field, Roy wanted nothing more than to bring another championship to Philadelphia. Halladay died on Nov. 7, 2017, at the age of 40 when a small plane he was piloting crashed off the coast of Holiday, Fla. into the Gulf of Mexico. Flying was always a passion of his, passed on from his father's career as a corporate pilot. He earned his license in 2013 and found himself immersed in the world of aviation, passing away following the crash of the very single-engine plane he purchased following his retirement. 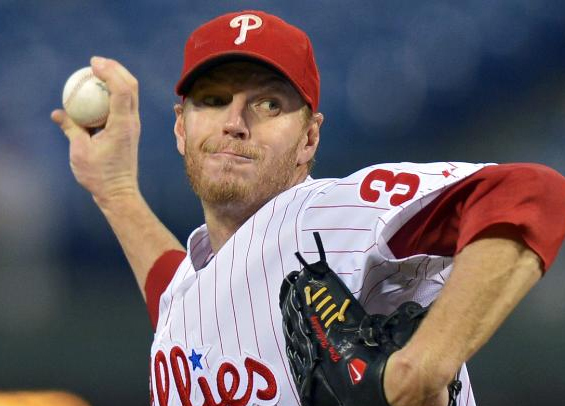 "Halladay loved everything that had to do with flying and brought drones into the clubhouse," former Philadelphia Phillies teammate Brad Lidge said on a Denver radio show following the news of Halladay's passing. "He was well in control of that thing. He liked to have fun with it. He would fly it around, right behind people's heads. You'd turn around and be a little bit startled. He got a big kick out of flying them." The Phillies honored Halladay last season with a spot on the Wall of Fame. "Roy Halladay made an indelible, unforgettable mark on Phillies history during his time with us," Phillies principle owner John Middleton said in a statement. "From his perfect game to his postseason no-hitter to his Cy Young Award, his accomplishments in red pinstripes are nothing short of legendary, and his placement in the Hall of Fame is well deserved. Even more impressive was the way Roy carried himself off the field, always giving back not just to his teammates, but more so to his community, whether it was here in Philadelphia or in the Pinellas County area. "For all he accomplished as a player and everything he stood for as a person, Doc will forever remain in the hearts of Phillies fans everywhere. My heartfelt congratulations go out Brandy, Braden and Ryan."